German-Mongolian documentary film. 2003. 87 min. Let’s take a look to a gem of a film produced by Byambasuren Davaa. The Mongolian director studied at the Hochschule für Fernsehen und Film in Munich as did her Italian co-director and cameraman Luigi Falorni. Basically, the film is a semi-documentary. Although shot in a calm and sensitive documentary style, a story is smoothly developed. 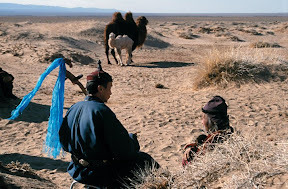 During one spring time we accompany a nomadic family in the Gobi desert who lives primarily from breeding camel. In the course of the film every day life is displayed. We can watch the production of wool, the preparation of salty milk tea, the playing of games and storytelling. After the birth of the first camel colt trouble suddenly breaks out. Another camel mare is having her first baby with some complications. That might be one reason she rejects her colt. As the family gets more and more upset regarding the weakness of the little camel, they send their children to the Province centre to look for a morin huur player, the only one who might be able to help. Mongols have special musical remedies related to the four types of domestic animals. “For camels, it is necessary to play the huur and sing a song that is believed to have originated with an elder who understood the animal language. It tells how a camel ran away to give birth to her calf and how the camel herder spent several days looking for her. […] As the herder took away her calf, the camel wept and sang. When the mother camel hears this song, she makes a wailing noise, weeps large tears, and gives the calf milk”. In the following scenes we witness an ancient ritual which helps the camel mare to accept and suckle her baby. The ritual music is performed on the morin huur serving partly as bourdon, partly as “long song” when alternating with the women’s chant. The female singer slowly repeats asemantic syllables in a “long song”-style with a voluminous voice and vibrato ornamentation. And what is more, in the course of the film we get a glimpse of the multifaceted musical genres of Mongolia such as work songs and sounds for animals, shell winding which harks back to the Tibetan Buddhist heritage, cheerful bogin duu (short song) within the family circle as well as urtin duu (long songs). The distinction between short and long songs is important in Mongolian music. The short song is rhythmically bound, syllabic and strophic whereas the melismatic, richly ornamented long song is metrically free and associated with festive ceremonies. A lot of Mongolians still live a traditionally nomadic life. Nevertheless, after the political turn in the 1990s, Mongolia has undergone a lot of changes. Nomads are migrating to the cities. Consequently the number of nomads has decreased even though plenty of them still inhabit a yourte in the heart of the capital. Moreover, the film doesn’t conceal actual tendencies entailed by globalisation processes. There is the little boy longing for television at home after having seen it in a neighbour’s yourte. A satellite dish almost as big as the yourte has become a common accessory of the steppes in the mean time. Due to the numerous close-ups scenes the spectator feels as if he was directly involved. Above all, Byambasuren Davaa made a film full of respect for the people whose lives she has depicted. As she was deeply touched by this issue in her childhood she had always wished to make a film about it. In an interview she argued that the film might be understood all over the world due to its universal themes such as longing for love, family cohesion and the relation between man and nature. No Responses to "Music as a remedy in Mongolian ritual"